Authors are always looking for ways to put their books in front of other people. We want to grow our audiences, so we’re constantly networking, posting online, and putting out feelers for ways to spread the word about our books. 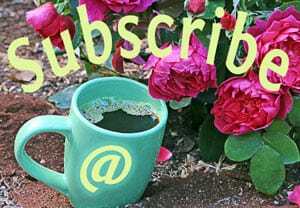 I’m no different, so it’s no wonder that I have my antennae up at all times for new ways to market my work. Book publicity? You can grow that! 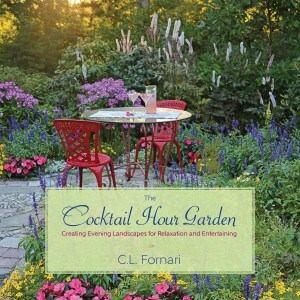 In addition to thinking about how to promote the books I’ve had published, I’m also interested in marketing in general and looking for ways to promote gardening as a whole. With all of this in mind, I frequently look for books that might spark new ideas and inspirations. One such book I read recently was Smartcuts, by Shane Snow, and one of the things he discussed was the way people can benefit from moving away from a traditional route and take unexpected paths that might lead to their goals more quickly. 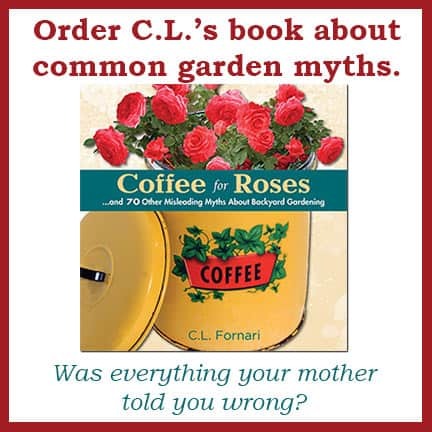 Something about Shane’s reasoning and examples led me to think about my book about garden myths, Coffee for Roses, and then to link those thoughts with how nature plants seeds. A dandelion puff carries a seed out into the world, for example. It might first land on the branch of a tree, or on top of a leaf where it won’t germinate. The seed might then hit the ground and grow, or it could caught on an animal’s fur, snagged on someone’s shoelaces or float down a river. At any point in this journey the seed might light on some soil, be watered and sprout. A seed’s route isn’t necessarily a Smartcut, to use Snow’s term for an unexpected pathway, but it isn’t a direct, expected road either. I wondered, could there be a connection between how nature plants seeds and the way author’s promote their work? Anyone who’s frequently in contact with the natural world knows that everything is connected to everything else…so a couple of weeks ago I decided to begin an experiment related to separation, connectedness and growing. I called this an experiment in Six Degrees of Germination. This kind of felt like a chain letter, but without the promise of good fortune if you pass it on, or bad luck if you don’t. But hey, I did enclose five more stamped envelopes, so I wasn’t putting too much of a burden on the recipient, right? In any case I sent three of these off to people I know who are pretty much not gardeners. That’s part of the fun, I figure. Why would I want to push this project down an obvious route? For this reason, I also sent a copy to Shane Snow. Any or all of these books might be dumped in the trash of course…continuing with the analogy, when nature scatters seeds most of them don’t end up in locations where they can sprout and grow. But on the other hand, a seed occasionally lands in a spot where the conditions are unexpectedly perfect for germination and the growth of the plant. Not knowing what, if anything, will happen with this project is part of the appeal. This project depends on the kindness and willingness of strangers, and that too is interesting. In these times when crowd-funded campaigns are enticing thousands, people seem to be intrigued with ways to create small, supportive communities out of global connections. I’ll let you know if any of the four books I sent out sprouts, but in the meantime, whether you’re a garden writer or an author in another genre, if you also give Six Degrees of Germination a try, keep me posted. Or send me a book and some envelopes…I promise to send them onward, like a seed on the wind. 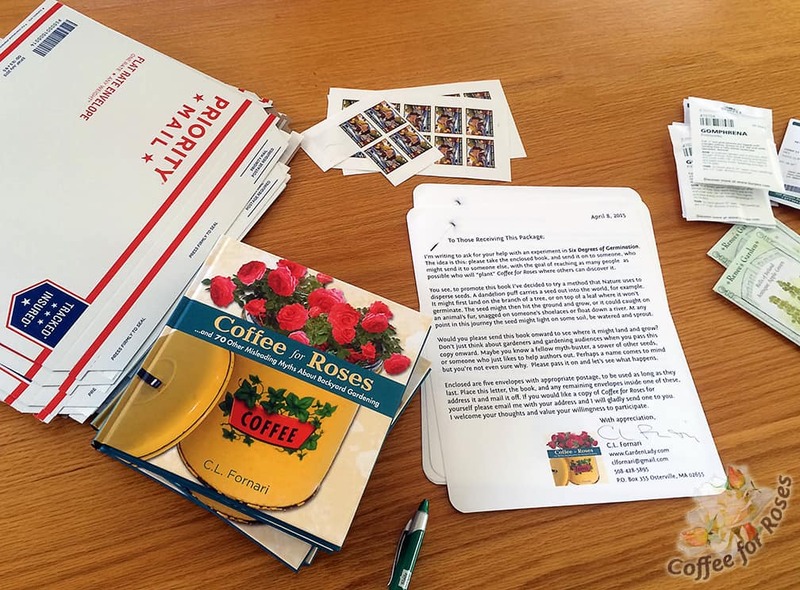 Books + letter + stamped envelopes = an experiment in unexpected routes. 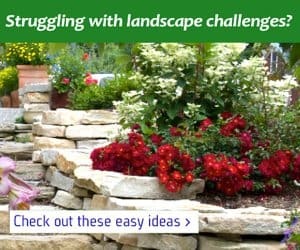 Plant flowers, shrubs and trees. Plant good deeds and books. 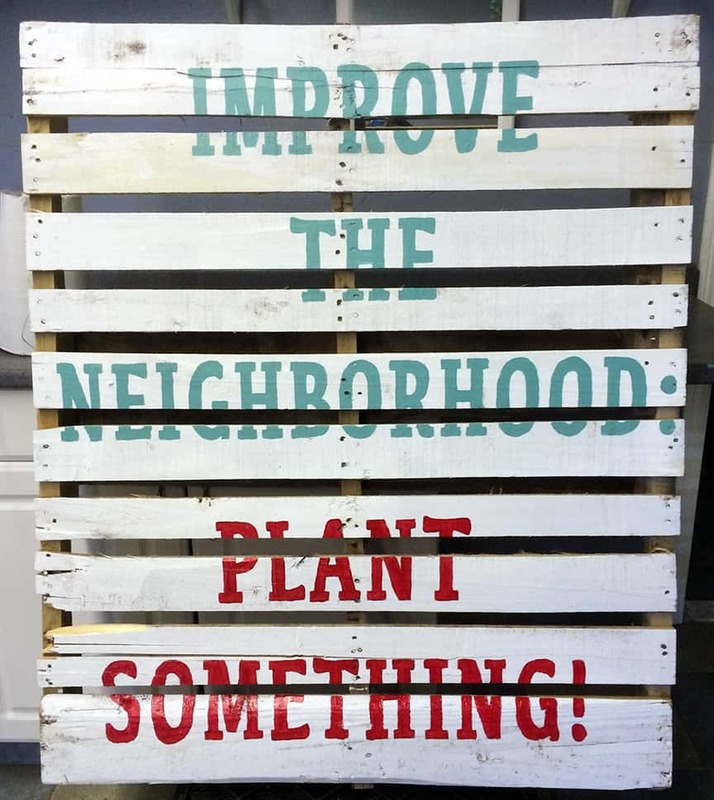 Plant creativity and generosity. Plant yummy, organic veggies.